I meant this post to be for Mother’s Day and I’m a little late. However, it is still spring and a time to celebrate all mothers – especially Mother Nature. I remember when my children were very small I had a plastic window box for flowers outside my kitchen window. In early spring when it was still empty, a pigeon made a nest in it and laid her eggs. One day there was a spring snowstorm and the little bird continued sitting on her eggs. Every once in a while she would fluff up her feathers to shake off the snow. Then the snow turned into a cold rain and still she sat there like a little soldier without moving. I watched and worried. Her motherly instinct would not let her abandon her babies. I understood her. I could see that the window box was starting to fill with water. When the rain did not let up and the water had reached her chest, I could stand it no longer. I took a chance and opened the window. She did not move. She was accustomed to seeing us very close to her through the kitchen window. I took a kitchen knife and cut holes into the plastic window box to let the water drain out. She let me get that close and still did not move. Did not abandon her eggs. I looked into her orange pigeon eyes and thought her the bravest of mothers. One egg hatched and we saw up close how she raised her baby. I would hoist my girls up to sit on the kitchen counter so they could see the window nest as the mother pigeon fed her chick and then later the flying lessons from the kitchen window box to the bedroom window box. Back and forth the fledging practiced and then one day was gone. It was a successful nest. 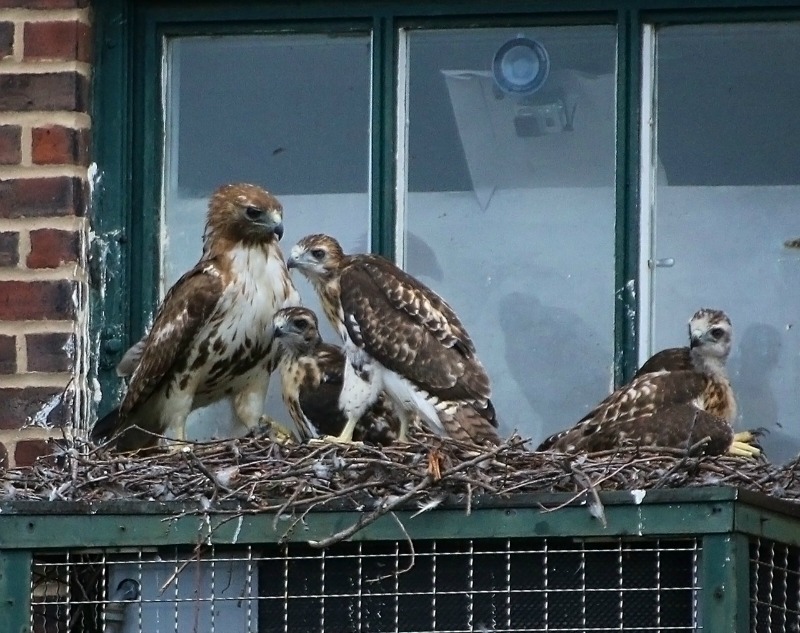 I became a live stream nest watcher when the City Room blog of the New York Times featured a camera pointed at the nest of the red-tailed hawks of Washington Square Park in New York City in the spring of 2011. There was high drama on that nest because the mother had a band on her leg that was put on too tight and her leg was swollen. An effort to capture her was planned. But then it was decided that it was too risky to attempt because the little fluffy white eyas (hawk chick) named Pip would freak out and maybe fall off the building ledge nest. Nature took its course and Violet was an excellent mother. We could see her on camera struggling with her lame leg while she fed scraps of rat meat to little Pip. Responsible and valiant, she hung on until her offspring left the nest and only then did she succumb to her injury. Christo and Dora are our neighborhood hawks. Their hunting ground is Tompkins Square Park. Last spring they made a successful nest and raised three baby hawks on an air conditioner at the Christadora apartment building across from the park. This year they’ve moved their nest to another air conditioner, this time on the Ageloff Towers on Avenue A. Their three eggs have hatched and we are now seeing the fluffy white baby hawks on a nest cam. Laura Goggin is a neighborhood photographer who has followed the hawks and shared her beautiful photographs on her blog Gog in NYC. I’m struck by the generosity of the neighbors who install a nest cam to share their view of the nest with us. Here is the link to the nest cam for Christo and Dora’s nest. Now I’m watching a different kind of animal, a critically endangered red wolf on the den cam at the Wolf Conservation Center in New York state. Salty gave birth to a litter of seven pups on May 2nd. It is a window into a wild world. On a warm night I can see that she is fast asleep. Her sides softly rise and fall with her breath. Her sleepy dark puppies are clustered close to her with their bellies full of milk. The cacophony of bug song has died down too from earlier in the evening when they were thunderous. Sometimes you can hear the other wolves howling. I feel very privileged to be able to witness these wild animals. Here is the link to the live den cam. The Year in Books is a project started by Laura of the Circle of Pines Trees blog that anyone can join. The aim is to make more time for books by reading at least one per month. For March I read The Omnivore’s Dilema. What an eye-opener. I thought I was a conscious person about eating well but after reading this book, I realized that I could do a lot more. This is a must-read for everyone. I’m lucky that I have resources for food that is grown/raised responsibly. In the summer when we are at our rural homestead, we eat grass-fed meat from pastured animals from local farms and eat vegetables grown without pesticides from our neighbor’s gardens. In New York city, I have been ordering meat and produce from local farms thanks to an online farmer’s market called Farmigo that let’s you shop for food on their website and then you pick the bags of groceries from a neighborhood drop off point once a week. I also shopped this way in the country through Schoharie Fresh. They even sell homemade pie and yarn from a sheep farmer. This seems to be a new model for the distribution of food from local farms to consumers. I think its a brilliant use of technology and I hope it spreads. 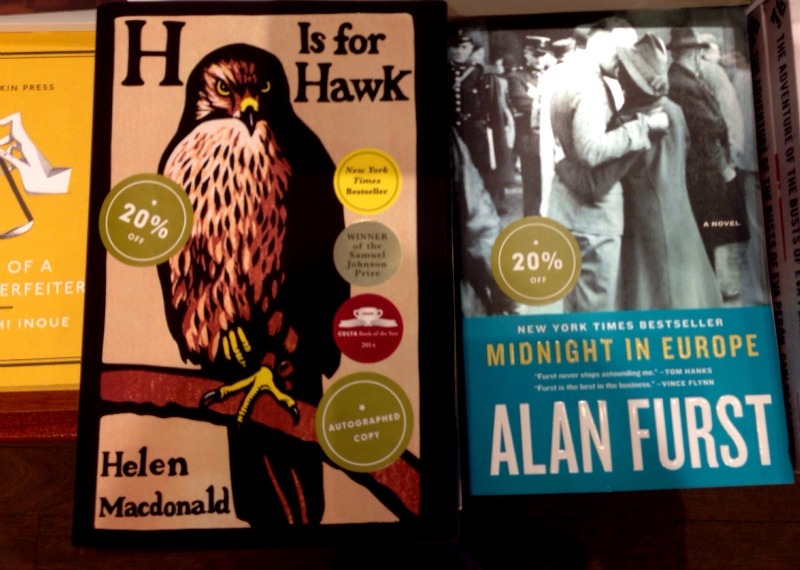 For April, I’ve picked up H is for Hawk by Helen Macdonald. I was sold by this review. 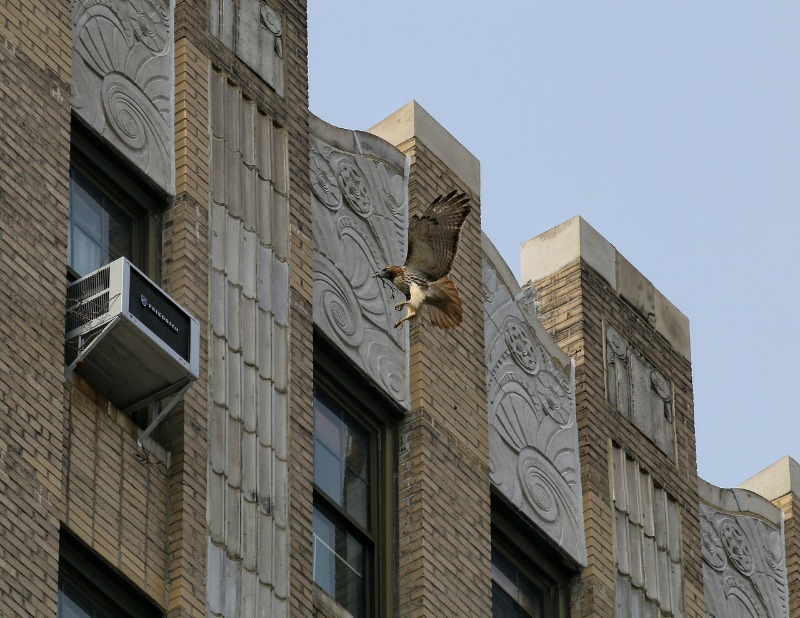 I follow blogs about the urban hawks in New York city. I think birds of prey are fascinating . 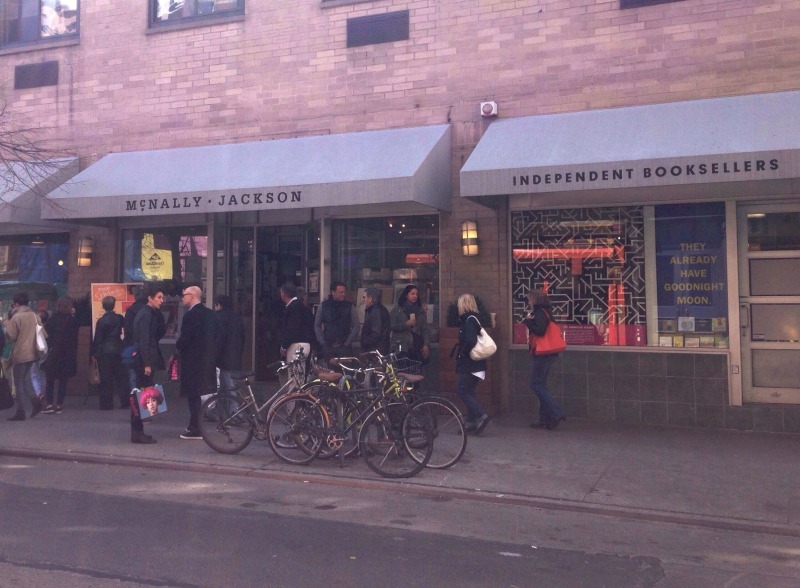 In keeping with the goal of buying the monthly books only from independent stores or borrowing from the library, I went to McNally Jackson, an independent bookstore on the eastern edge of Soho. 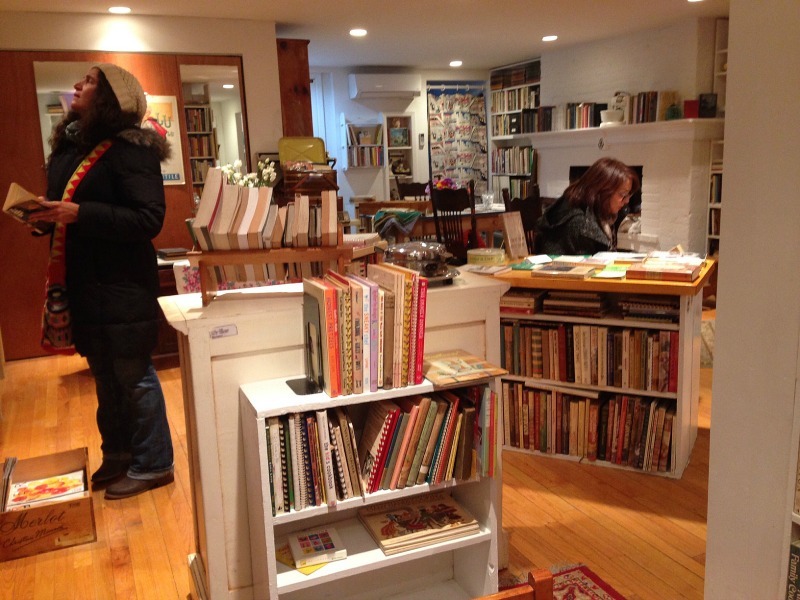 It is a lively well organized bookstore with a cafe and many events. I’m excited about starting my new book. In New York City, its pot hole season, this time between winter and spring when the streets are pitted with holes from the ice and salt of winter. Not romantic. You have to watch out for the holes when you are on your bike. In the country, it is mud season. 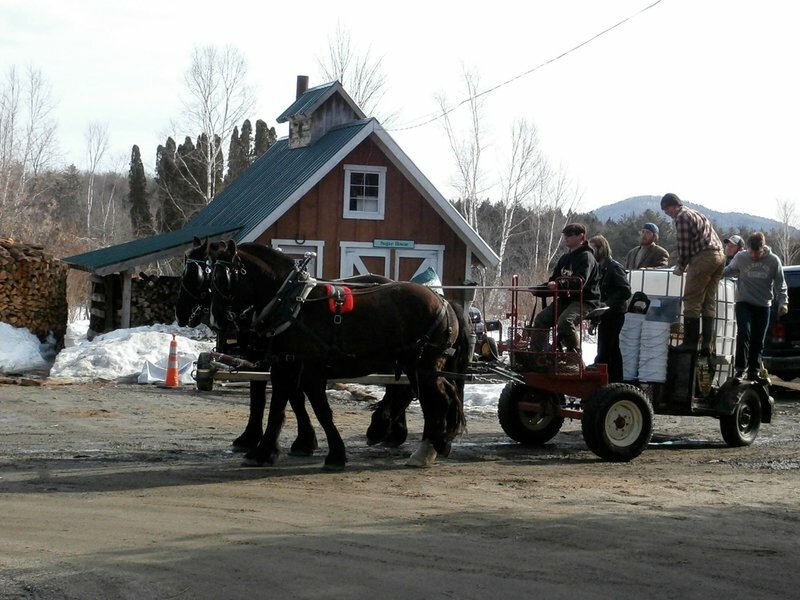 Also sounds not romantic except that it is sweet and magical because it is also the time for maple sugaring. 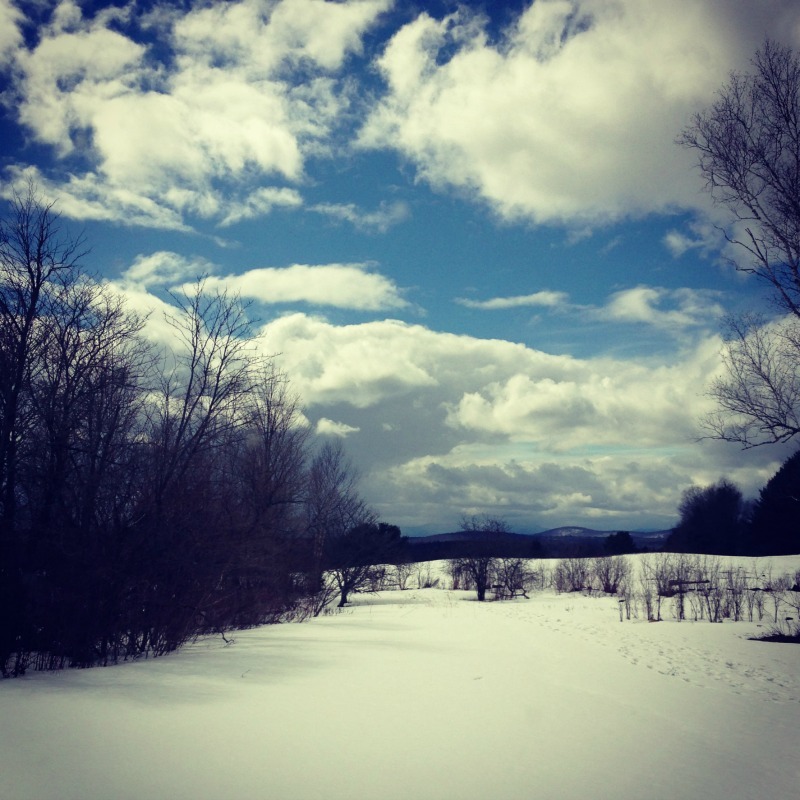 I have visited my daughter at her college in Vermont when the snow is melting and the sap starts flowing in the maple trees. As I’ve always said to my daughters, there is nothing more energizing or more beautiful than to be amongst people who think they can change the world. Oona’s college is such a place. Sterling College is one of the seven colleges in the Work College Consortium, a tiny school with a big community spirit dedicated to environmental stewardship. The students work with both their hands and their minds. They have a farm. They eat the food they grow. 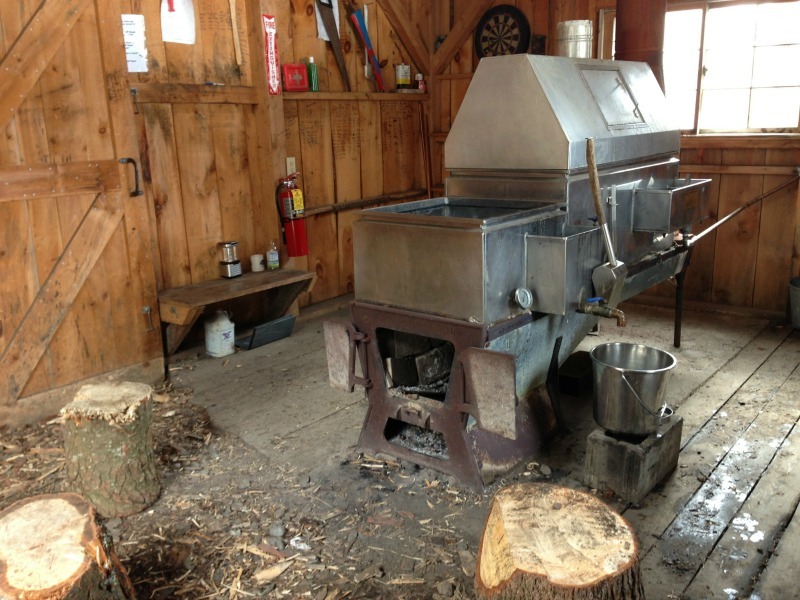 They have their own sugar house where they process the sap collected from the maple trees and turn it into maple syrup. 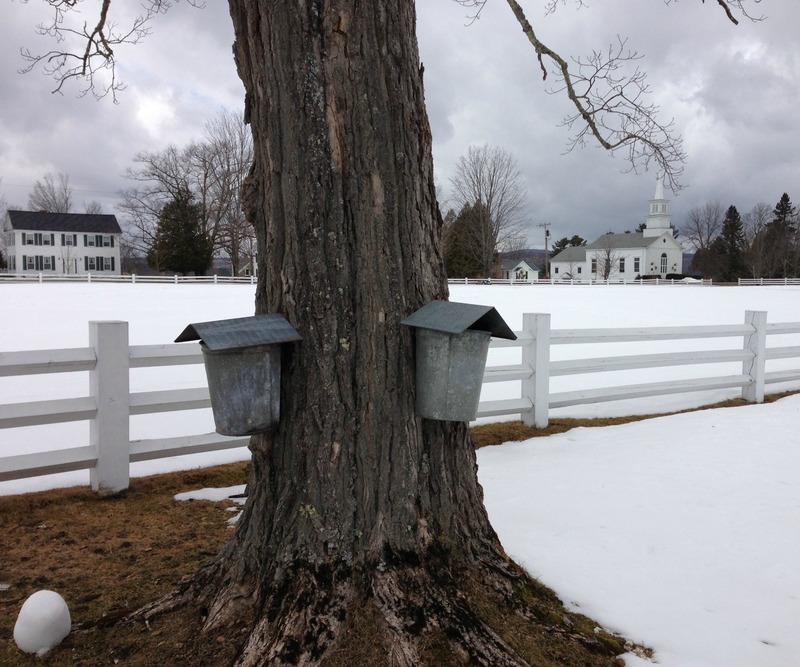 In the small village every maple tree you see has buckets attached to collect the sap. Our dear friend Rob Handel, Chef at Heather Ridge Farm in Schoharie County, New York generously sent me these maple recipes to share with you. Thank you Rob. Add all ingredients to a blender and blend until well emulsified. Store in the fridge for up to one month. Melt the butter in a medium sized skillet and add onions, parsnips and salt. Cook over medium low heat until well caramelized about 30 minutes. Add remaining ingredients and simmer until everything is softened and most of the water has been absorbed, about 20 minutes. Serve immediately or store in the fridge for up to two weeks. Chef Rob says: This panna cotta recipe only involves 10 minutes of prep time, can be made in a single pot and it is fabulously rich. Here we go. Place milk in a medium sauce pan and sprinkle gelatin on top. Allow to bloom for 5 minutes, then add remaining ingredients and bring to a low simmer. Stir until the gelatin is fully dissolved and pour into molds. Allow to set for at least 2 hours or prepare ahead and refrigerate for up to 4 days. 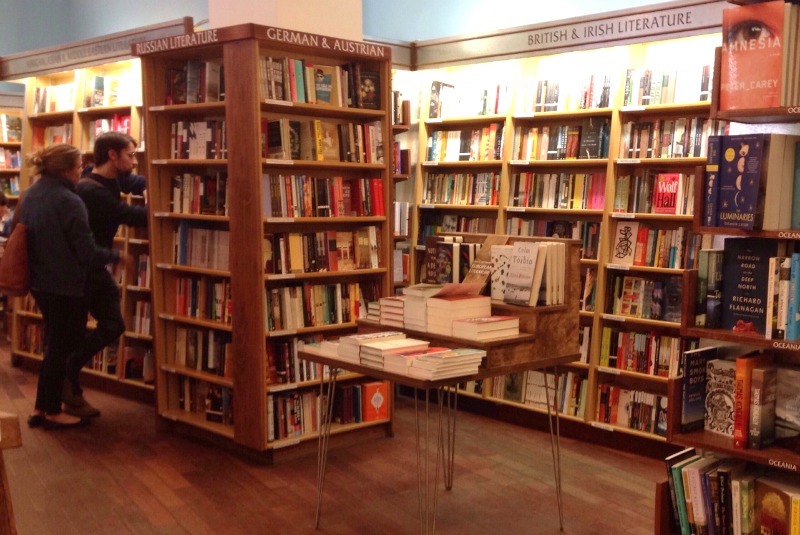 For my March book, I decided to visit the new bookstore in the neighborhood. 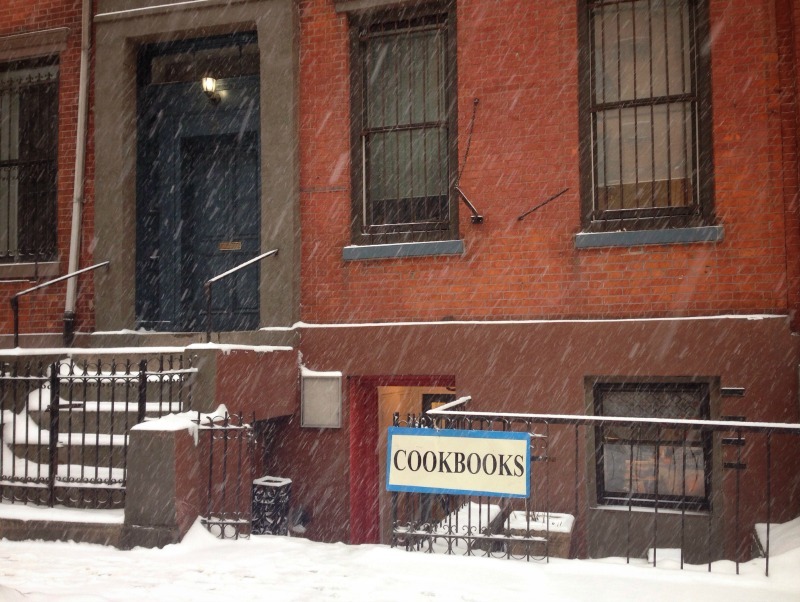 Bonnie Slotnick’s Cookbooks was priced out of its West Village home and the happy ending to the all too familiar New York story is that some book lovers offered to rent her space in the basement of their family townhouse in the East Village. 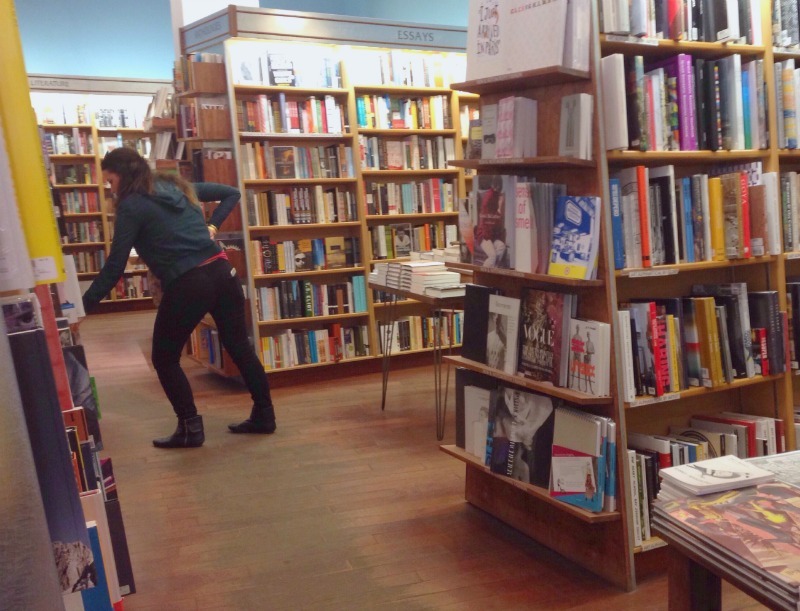 And so, another bookstore has survived in New York City. On a very snowy Sunday afternoon, red-cheeked and with snow encrusted eyebrows, my friend Katy and I entered the warm and homey store. Bonnie Slotnick welcomed us by pointing out where the radiators were so that we could warm up first. What a charming and inviting bookstore. I felt like I was in someone’s home, albeit a person with a lot of bookshelves. 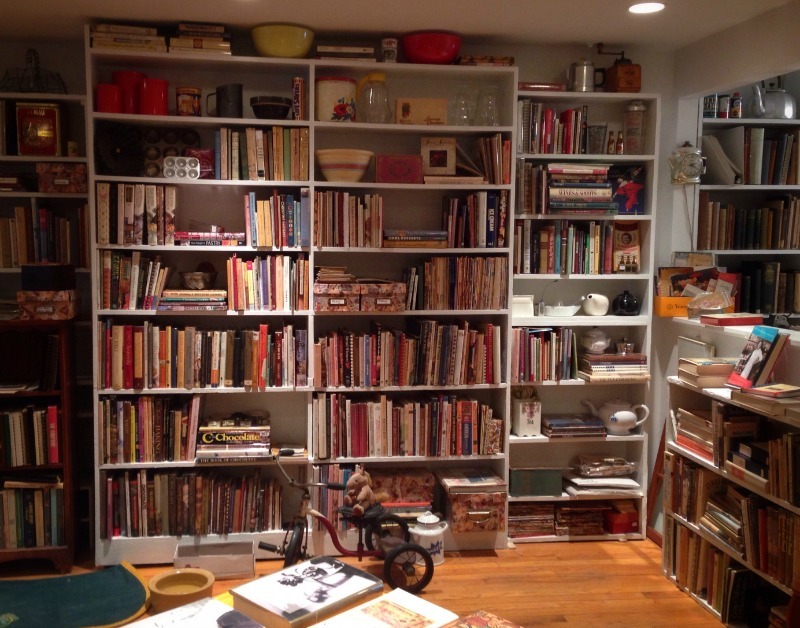 Bonnie Slotnick Cookbooks specializes in Out-of-Print and Antiquarian Cookbooks. I picked out a 20 year old cookbook from the Florida Keys with lots of recipes for fish and rum cocktails. Standing there in my wet snow boots reading tropical recipes ringed with illustrations of palm trees felt good. I searched for a proper book for my March read and found “The Omnivore’s Dilemma: A Natural History of Four Meals” by Michael Pollan. I’ll let you know how it goes.